Who isn’t enthralled by the visual magic of colorful holiday lights? And if you can enjoy the sights in a horsey environment even better! Both Del Mar racetrack near San Diego, California, and Kentucky Horse Park in Lexington host incredible light displays that you can enjoy from the comfort of your car. Del Mar’s Holiday Lights Tour boasts the largest animated drive-thru tour on the West Coast. The 1 ½ mile route winds its way around the racetrack and takes about 20 minutes to complete. For information visit www.sdfair.com. 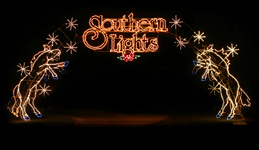 Kentucky Horse Park’s Southern Lights extravaganza is an annual fundraiser for the famed equestrian park. You can get in the mood by going to www.southernlightsky.org. Sounds beautiful! I love all the Christmas lights. that sounds SO cool! I would love to go! Oooh – wish I could be there!! !